Quality masking tape for protecting your trim, paint and more! The paint safe 3M Automotive Masking Tape is great at protecting your trim you don't want hit with your buffer or hand applications. Apply it before polishing, glazing, sealing, waxing, treating your trim and so much more. It will help ensure you don't damage or treat any surface that you didn't intend to treat. If you get some sealant or wax on your trim you can get that dreaded white stain left behind that can be challenging to remove. Instead take a basic pre-caution and tape off your trim to avoid this issue all together. This multi-use general masking tape applies easy and removes easy, leaving no sticky residue behind. If you are looking for a masking tape specially formulated for protecting trim, emblems, lights, rubber, delicate surfaces and more while polishing we would recommend the 3M Automotive Performance Masking Tape. 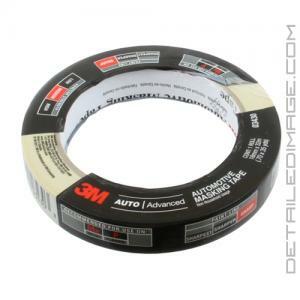 If you are looking for the perfect general use masking tape, then the 3m Automotive Masking Tape is for you! After trying all kinds of tape, I have finally settled on 3M Automotive Masking Tape. The main thing I like is the fact that it sticks to the surface continuously so I don't have to simply tape up a panel just before polishing it, then remove the tape before it comes up and starts leaving sticky residue on the pads. I have had to buy this because you discontinued the Meguiars Masking Tape rolls. Personally, I do not like this tape for 2 reasons - 1- It is not as "sticky" as the Meguiars tape was.. 2 - There is not nearly as much tape on the roll as the Meguiars tape rolls..